The Patient-Driven Payment Model (PDPM) will be here before you know it, October 1, 2019. LeadingAge Kansas has partnered with BKD CPAs and Advisors to bring you the professionally designed PDPM Academy. The PDPM Academy will give you the insights, the tools and access to experts that you will help you be ready for the new model like a pro. Building a foundation now will help you be PDPM prepared. Each session will build upon the rules and regulations that CMS puts out as we progress through the year with this academy. Sign up now, you won't want to miss a thing. *The purchase of any Webinar, Q&A Call or Roundtable includes the PDPM Toolkit. Q & A Call Ask an Expert Session, January 15, 2019, 2:00 - 3:00pm | A reminder will be sent out to submit your questions by January 11. Please utilize the video checkpoint description above and video from January 9th to help you formulate and organize your questions for the Q&A Call. Join LeadingAge Kansas and BKD’s Sherri Robbins, RN, BSN, CLNC, RAC-CT, LNHA and John Harned, CPA, LNHA to discuss practical implementation processes for PDPM at the first set of roundtables with PDPM. We encourage you to bring your implementation committee (up to five individuals from each organization) in order to gain the most value from this experience. The learning style will be a facilitated discussion of best practices for each area of focus on your implementation committee. For example, ICD-10, MDS, Therapy, Nursing, Education and Technology will be grouped together by area of specialty, in a typical roundtable format, to maximize the group learning dynamic. This will be a great opportunity to discuss whatever you are needing most at this time. Q&A Call Ask an Expert Session, March 21, 2019, 2:00 - 3:00pm | A reminder will be sent out to submit your questions by March 15. Please utilize the video checkpoint description above and video from March 11th to help you formulate and organize your questions for the Q&A Call. Q&A Call Ask an Expert Session, June 11, 2019, 2:00 - 3:00pm | A reminder will be sent out to submit your questions by June 7. Please utilize the video checkpoint description above and video from June 3rd to help you formulate and organize your questions for the Q&A Call. The July roundtables will keep the same format with open discussion, group activities and Q&A. But this will be a deeper dive into what’s to come with therapy, nursing and MDS regarding documentation and communication. 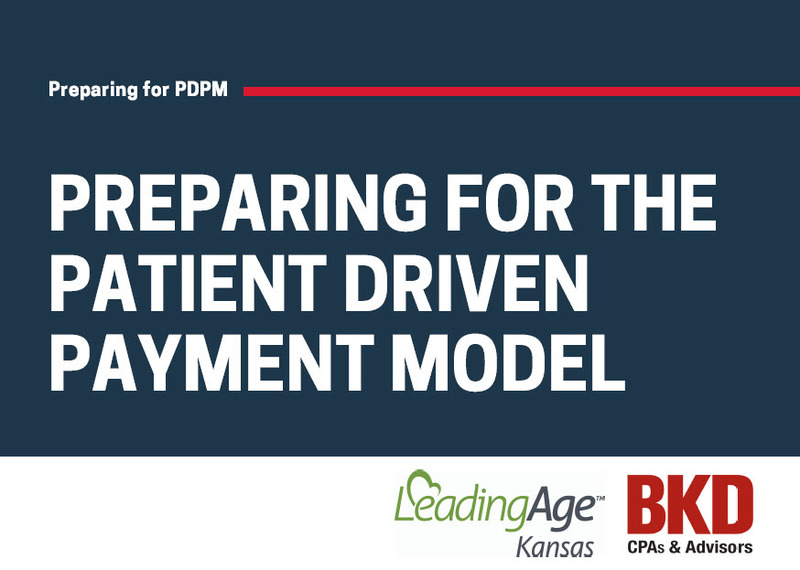 Together with the support of LeadingAge Kansas, BKD, colleagues and other providers as the date PDPM goes into effect grows closer you will need to work on really building your knowledge and skills. This roundtable is exactly the place to do that. We would like to wait as we see the rulings come out to provide an accurate description for this webinar. Our goal is to build upon the education we have already given you and without the rulings we cannot properly do so. The final education of PDPM Academy is crucial, but what is most important is that you begin to actively work on this transition with your team and organization as soon as possible. You will only be successful if you are active in your efforts to be educated and working on an implementation plan for PDPM. Q&A Ask an Expert Session, September 24, 2019, 2:00 - 3:00pm | A reminder will be sent out to submit questions by September 20. Please utilize the video checkpoint description above and video from September 10th to help you formulate and organize your questions for the Q&A Call. Roundtables - Cost includes up to five attendees from your organization. Up to 3 hours of CE will be available. Q&A Call Ask an Expert Sessions - Priority will be given to questions submitted two working days in advance of the scheduled call. No CE will be available for calls. Webinars - Up to 6 individuals may attend and receive continuing education with one webinar login. One hour of CE will be available. This educational event has been approved for up to 8.0 continuing education hours in the core of Administration for Licensed Adult Care Home Administrators, Adult Care Home Operators and Dietitians by the Kansas Department of Aging and Disability Services. Health Occupations and Credentialing approved provider number (LTS A0009). LeadingAge Kansas is approved as a provider of continuing nursing education by the Kansas State Board of Nursing. This course offering is approved for 8.0 contact hours applicable for APRN, RN, LPN or LMHT relicensure. Kansas State Board of Nursing provider number: LT0102-1116.